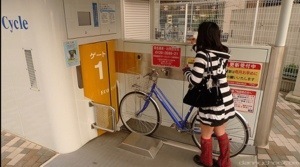 Giken in Japan have been pushing automated underground car parking for a while and now they have produced a smaller version for bicycles. It looks awesome. You ride up to it, swipe your access card and your bike gets whisked away into the underground store. It gets kept dry, secure and out of sight. Love it. I hope we get one in Australia soon, I can’t wait to try it. Giken describe their concepts as ‘function below ground, culture above ground’ I wonder what other functional stuff we could put below ground? Reblogged this on Decarbonising Life.